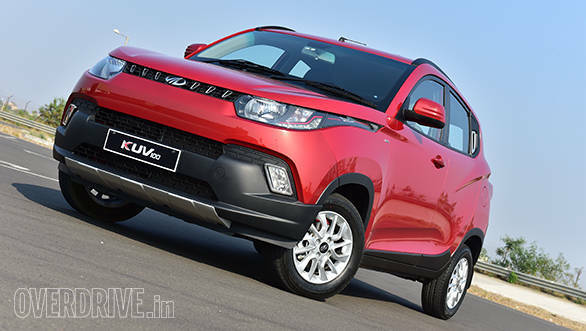 Mahindra has launched their all new SUV, the KUV100 in India at Rs 4.42 lakh, ex-Pune. The Mahindra KUV100 comes in seven variants and is the smallest SUV in the company's product portfolio. The KUV100 looks like a pseudo crossover hatchback. It has a bold grille with wraparound headlamps and LED DRLs integrated into them. The turn indicators are also integrated into the headlamps. An all-new alloy wheel design also debuts on the KUV100. The rear door handles are recessed into the C-pillar like the Chevrolet Beat. At the rear, the lamps remind one of the Grand i10. Mahindra have also integrated a roof spoiler on the top trims of the KUV100.